The organisation of the Defi Wind just announced, that the registration is open from now on. 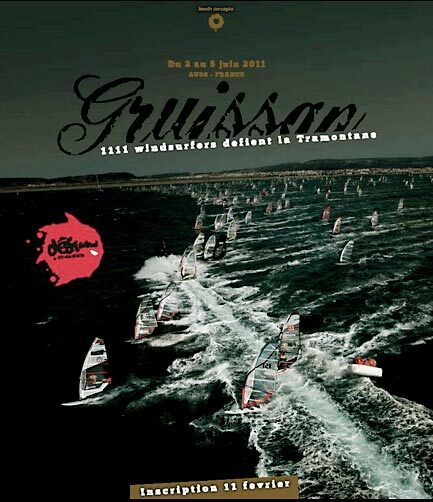 So, if you are interested to be one of the 1111 competitors, who compete in the long distance race at Gruissan from the 2nd till the 5th of June 2011, register soon! The Defi Wind 2011 registration is on (Pic: Defi Wind). Did you know that windsurfing celebrate its 42th anniversary this year ? When you see its appearance, we can say unashamedly that the “40’” is in the pink. Well we are no longer in the heyday of the 80s/90s World Cup, but the windsurfing remains a major sport in the community of gliding sports. This vitality belongs rightfully to the longevity of its players. The big names are always on the front of the stage, even if their image changed somewhat over time. Today they have more profile “water man” highly skilled, braving the elements on different boards. Robby Naish, the legend at all, is the best example. The famous and legendary sail number “US1111″ is present on all fronts. His passion for the sea, wind and waves is pushing himself daily for windsurfing, kitesurfing, stand up paddle, or even surfing. His renowed “US1111″ has many imitators. Many of those displayed derivatives numbers. As if the “1″ could gave wings. The most emblematic is undoubtedly the alien “E11″, who has reigned as a total master on the World Cup in the 90s. With 12 titles of World Champion, Bjorn Dunkerbeck now become “SUI11”, has stifled competition between 1988 and 1999. Pascal Maka on his side and his number “1″ wrote the most beautiful pages of the speed records history. Nathalie Simon, “FR111″, has been our charming ambassador for many years. Her presence on TV screens still contributes to the promotion of windsurfing. But there are still one, who dared to use the same sail number as that of Mister Naish. One in all and for all who put four “1″ in its sail. Unconsciousness, provocation, challenge… Not any of that, just a deep respect for his master. Jason Polakow “KA1111” is a talented rider, amazing, exceptionally fluid in everything he does on the water. He is the only one who can proudly display in his sails the 2nd “1111″ in the history of windsurfing. And he does it perfectly ! But windsurfing is not just a numbers story. Sailing schools continually welcome future windsurfers. The exclusive club of Olympic welcomes the windsurfing discipline still. Schedules of sporting events are very well booked. Hundreds of windsurfers pass the starting line within some seconds at the Defi Wind (Source: Defi Wind). And the Defi Wind have had the audacity to send 5500 windsurfers in the tumult of the Tramontana north wind over the last ten years. Unbelievable ! Yep, the naughty kid, who will blow his 11 candles this year has made a unique great name in the wonderful world of windsurfing. A unique place for a unique event, nothing more logic to that. A team of enthusiasts friends, who has extraordinary experience in organizing sailing events for thousand competitors, a place ideally suited, a steadfastness political will and finally the Tramontana, its closest ally, all these factors make the Défi Wind, what it is now, the biggest windsurfing event in the world ! Defi Wind 2011, it is 1111 competitors who meet up for the 11th consecutive year in Aude (11), in Gruissan. Through this game of numbers the 2011’ Défi Wind complete symbolically the most extraordinary saga of windsurfing mass events. In the spirit of all those who knew it, the Défi Wind will be forever inscribed as the finest windsurfing gathering that the planet has never known !